Photograph of King Thibaw’s Kyaung at Mandalay, taken by an unknown photographer in the 1890s. Mandalay was founded in 1857 by King Mindon Min of the Konbaung dynasty, the penultimate king of the Burmese, and became the last great royal capital. Thibaw was the last king of Burma and ruled from 1878 until 1885, when Mandalay was annexed by the British Empire and he was exiled to south India together with his queen Supayalat. As a consequence of royal patronage Mandalay had a rich heritage of religious architecture. This is a general view of the kyaung or monastery in which Thibaw was educated. It is built in the traditional raised pavilion form with tiered roofs, surrounded by a veranda with steps at the cardinal points of the compass. The spire marks the shrine room. Befitting its royal function the monastery is richly decorated and ornamented with elaborate woodcarvings. It is probable that the title refers to the Burmese practice of dismantling the architectural elements of royal buildings and reusing their components in other buildings, in this case as a throne in the royal palace. 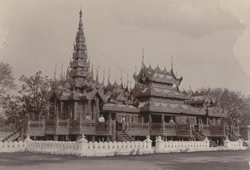 The photograph is from an album devoted almost entirely to Lord Elgin's Burma tour of November to December 1898. Victor Alexander Bruce (1849-1917), ninth Earl of Elgin and 13th Earl of Kincardine, served as Viceroy of India between 1894 and 1899.